Leaving beautiful Dubrovnik wasn’t something we were too excited about, especially since it was our last stop in Croatia (for this trip – we’ll definitely be back!). Bosnia & Hercegovina (Bosnia hereafter, to save on keystrokes and spelling errors) is a country we were much less familiar with, other than we knew there was a war there in the 1990s. We were pleased to discover that it was one of the most beautiful and interesting countries we visited in our 10 months of traveling. 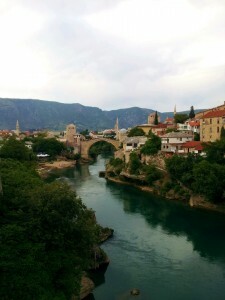 There are two major tourist destinations in Bosnia, Mostar and Sarajevo. Our first stop was Mostar, which is located in the unpronounceable Herzegovina region that makes up the other half of Bosnia’s official name. 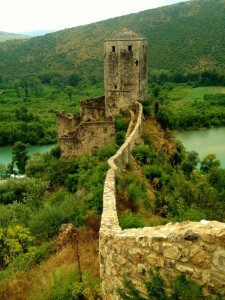 It is most famous for a beautiful medieval bridge that crosses the Neretva river which runs through town. The bus ride there was very scenic, and when we arrived in town, we did our tourist duty and walked up (and ate dinner near) the bridge. It was very pretty impressive. One thing our hostel offered was to coordinate a jump from the 20m (60ft) high bridge into the river, complete with lessons and a wetsuit (the water is cold there, as its all runoff from the mountains). Others choose to save the 25€ and do it without lessons. While we were eating dinner, we witnessed one guy (obviously not trained) climb over the railing and do the jump. Happily, he lived to tell about it. Our hostel, Deny Rooms, and its neighbor, Tito’s Hostel, offered a Hercegovina tour that offered a unique opportunity to see some off the beaten path attractions in the countryside. 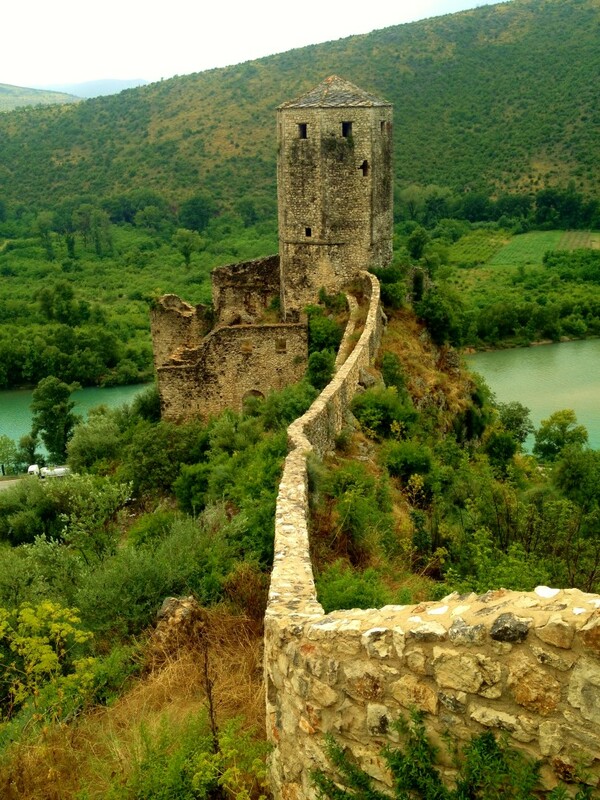 Herzegovina is in the southern half of Bosnia, and was our first introduction to the diverse cultures that have ruled in Bosnia, the war and the feelings of the local people 20 years later. Quick history lesson: The Bosnian War is way too complicated to begin to explain here, so read up online, but this specific area was under siege by the Croats (ethnic people of Croatia) for a few years in the early 90s before they made peace. The northern part of Bosnia, specifically Sarajevo, was under siege by the Yugoslav Army and the Serbs, and that siege lasted several more years after there was peace in Hercegovina. But I’ll get into that more in the upcoming Sarajevo post. Almost all of Mostar was destroyed during this time, and the famous bridge, which stood for hundreds of years, was destroyed by Croat rockets. It wasn’t rebuilt and reopened until 2004, when tourism finally started returning to the area. Our first stop was breakfast by the tourist area near the Buna river (Blagaj Tekke). We learned how the Bosnians cook meat and cheese pies called burek in a covered pot, which was a traditional method used by the Ottomans through their rule until WWI. We visited the highlight of the area, an old Ottoman Dervish (kind of like a monk) house set against a beautiful cave. Afterwards, we went to the Roman Catholic church in Međugorje, which the Bosnians consider the third pilgrimage site for Virgin Mary enthusiasts, behind Fatima in Portugal and Lourdes in France. The Vatican does not actually recognize the site as an official pilgrimage destination, because not enough people have been healed when visiting there. We happened to be there on the 33rd anniversary of the apparition of the Virgin Mary in a cloud seen by 4 local teenagers so there were thousands of Catholics, mostly from Italy, there to commemorate. There were also a lot of shops cashing in on the hoards of tourists. 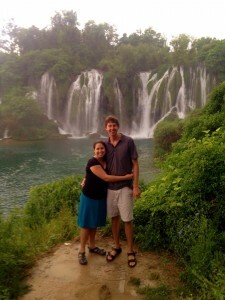 The next extended stop was at the waterfalls at Kravice, the tallest of which were about 25m (75ft) high. They were really beautiful, and there was a nice picnic area to watch the falls. Our guide encouraged us all to go swimming, even though the water was cold (he said people did it in February, so we shouldn’t be afraid). We all jumped in (because you rarely have the chance to swim in a waterfall in Bosnia) and the water was freezing. We swam up to the waterfalls, and got to explore some caves behind them. By the time we got out, we were all a bit blue, so we warmed up with some tasty Bosnian bar-b-que. Our final destination was a small medieval town called Počitelj, which was invaded by the Croat army and its residents forced to flee. Today, only about 30 people have come back to the town, and only one child has been born there in the last 10 years (it was a big deal). The town is famous for its fortress and city walls, which were beautiful, but it was hard to ignore the tragedy of the town’s history nearly wiped off the map. Our time in Mostar was short (there wasn’t much else to see, really), so we were off to Sarajevo the next morning, but we did make time to go to Ali Baba cave bar while we were there. It is a bar in a cave, and yes, it’s as cool as it sounds. Except for the large bed in the back of the bar – not sure what was up with that. A neat place to have a drink after a heavy day in Mostar.